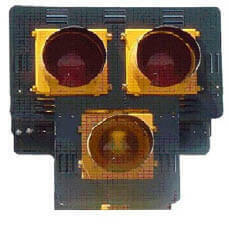 Traffic signals are placed at intersections to control the orderly movement of traffic and to prevent crashes. Drivers (including bicyclists) and pedestrians must obey these signals except when an officer is directing traffic. If a traffic signal is not functioning at all at an intersection, all drivers must treat the intersection as if a stop sign is posted for all directions. If a traffic signal is malfunctioning and flashing, drivers must proceed based on the color of the flashing signal they are facing: if the driver is facing a yellow flashing signal, the driver may proceed with caution; if the driver is facing a red flashing signal, the driver must stop and wait until it is safe to proceed. A red light means you must make a complete stop before entering the crosswalk or intersection and wait until the light turns to green before proceeding. 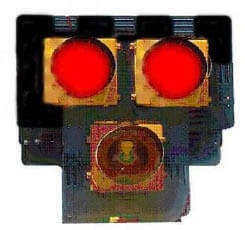 A yellow light warns that the light is changing from green to red. Slow down and prepare to stop. A green light means you may proceed if it is safe to do so after stopping for pedestrians and yielding to vehicles within the intersection. A green arrow means you may proceed carefully only in the direction the arrow is pointing after stopping for pedestrians and yielding to vehicles within the intersection. In this case you may go straight ahead only. A green arrow, in this case, means you may turn in the direction of the arrow after stopping for pedestrians and yielding to vehicles within the intersection. A yellow arrow may appear after a green arrow and warns you to clear the intersection. 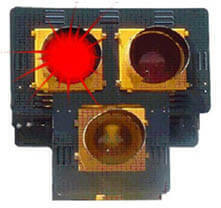 A red flashing light means you must stop completely (treat as you would a stop sign). 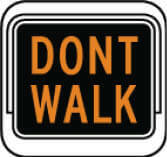 Proceed with caution only after yielding the right-of-way to pedestrians and to other vehicles at the intersection. A yellow flashing light means you must slow down and exercise caution before proceeding through the intersection. A flashing yellow arrow means you may turn left after yielding to oncoming traffic and pedestrians (oncoming traffic still has the green light). No travel allowed in this lane in the direction you are going. “Steady” – clear the lane “Flashing” – left turn permitted. Straight or left turn only. Leave the curb to cross the street. Flashing – do not leave curb, but complete walking across the street if already started. This signal is known as a Pedestrian Hybrid Beacon (PHB), and it is designed to help pedestrians safely cross busy streets. Pedestrians push a button to activate the overhead beacon and stop road traffic. 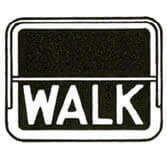 When WALK appears on the Pedestrian signal, pedestrians can cross the street. The PHB remains DARK for traffic unless a pedestrian activates the push-button. 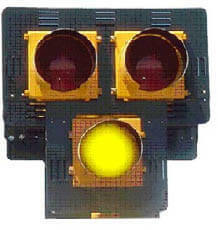 The solid yellow is followed by double SOLID RED signals, requiring drivers to stop. 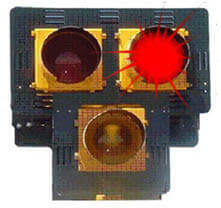 The double solid red signals are followed by alternating FLASHING RED signals. This requires drivers to come to a full STOP, and proceed when pedestrians have cleared the crosswalk. The signal will then go dark until activated again by a pedestrian. 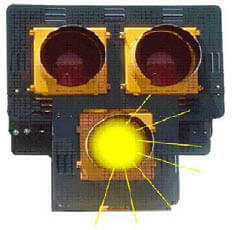 When a pedestrian presses the button, the signal is activated. 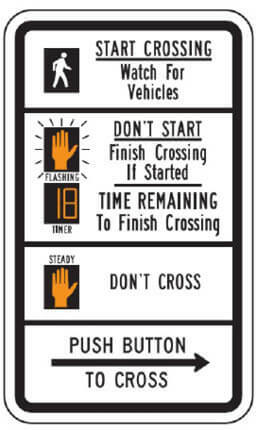 Approaching drivers will see a FLASHING YELLOW signal for a few seconds. The flashing yellow is followed by a SOLID YELLOW signal, indicating drivers should reduce speed and be prepared to stop.